Identifying a client’s Risk Band, provides advisors an opportunity to identify and discuss portfolio risk and financial goals. When a portfolio scores within the Risk Band, risk is appropriately allocated. When a portfolio scores outside of the Risk Band, there is room for discussion. Totum offers a customized questionnaire based on 11 questions and a shortened questionnaire for a website and mobile phones. 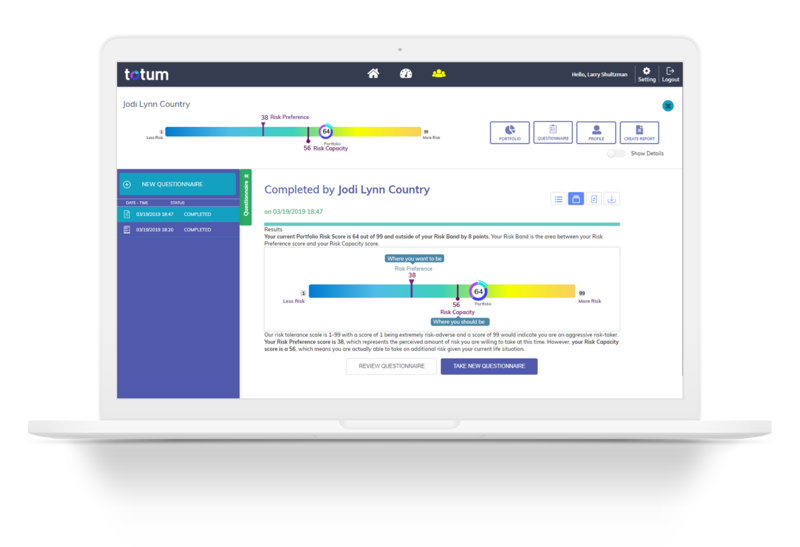 Totum incorporated machine learning as well as over 60 pages of PhD designed algorithms on the back end to provide results that are accurate enough to hold up in arbitration. All questionnaires and scores are archived for compliance purposes. Totum is listed in the FINRA Compliance Vendor Directory. 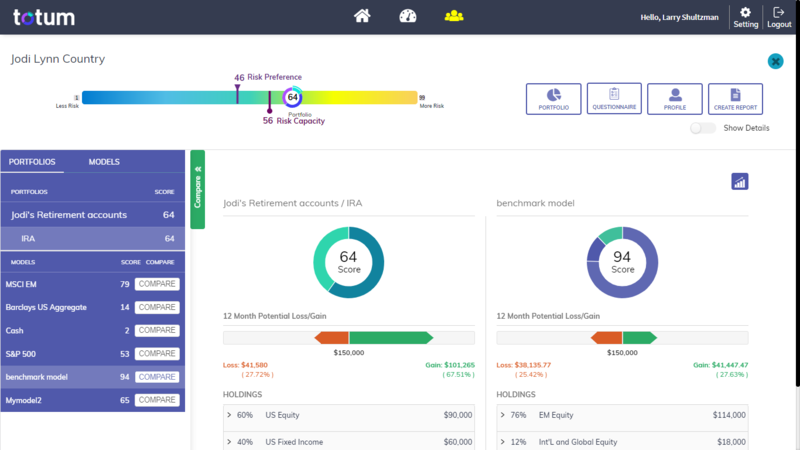 Apply your customized model portfolios to match your client’s risk scores. Easily upload your current models through our Excel template. 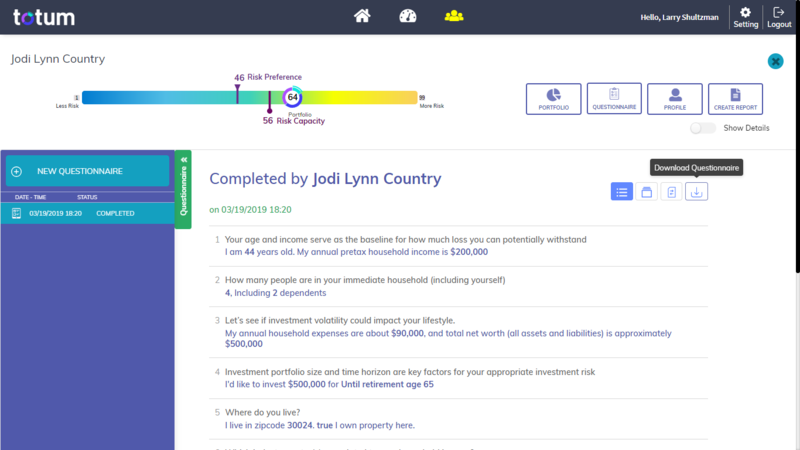 Integrate directly through your custodian, broker/dealer, insurance firm, bank or other third party Fintech Solutions to automatically review your client’s accounts and portfolio scores. 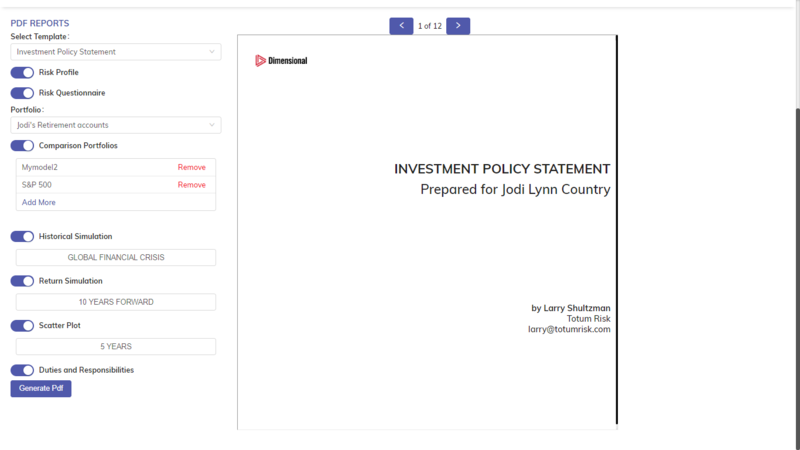 White label and customize your own Investment Policy Statements, Client Summary, or Portfolio Summary. Include portfolio comparisons, recommendations, analytics, stress test, monte carlo simulation, historical returns charts, and more.